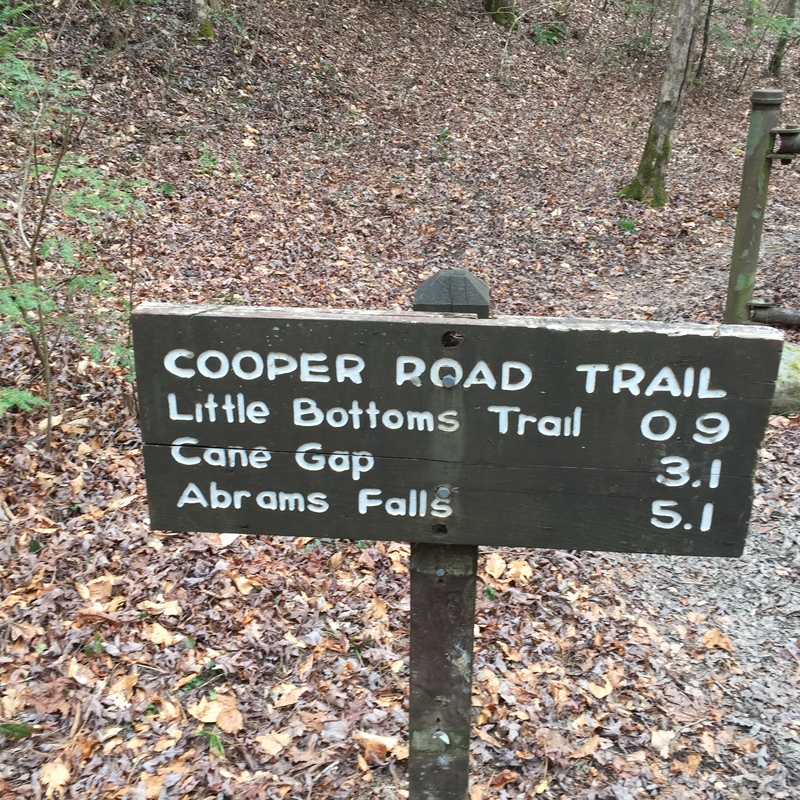 Cooper Road Trail presents a host of options for different loop hikes leading out of Cades Cove and Abrams Creek Campground as it intersects with 5 different trails and has two distinct trailheads. As for hiking it is downright delightful in that it only climbs 1,100 feet over its 10.7 miles. It is definitely one of the longer treks in the park if hiked one-way but that is the challenge. It really doesn’t fit in a one way scenario, nor does it work as a simple loop. For the 900 miler, it will end up being hiked in several sections over a few days. Such is the case here. 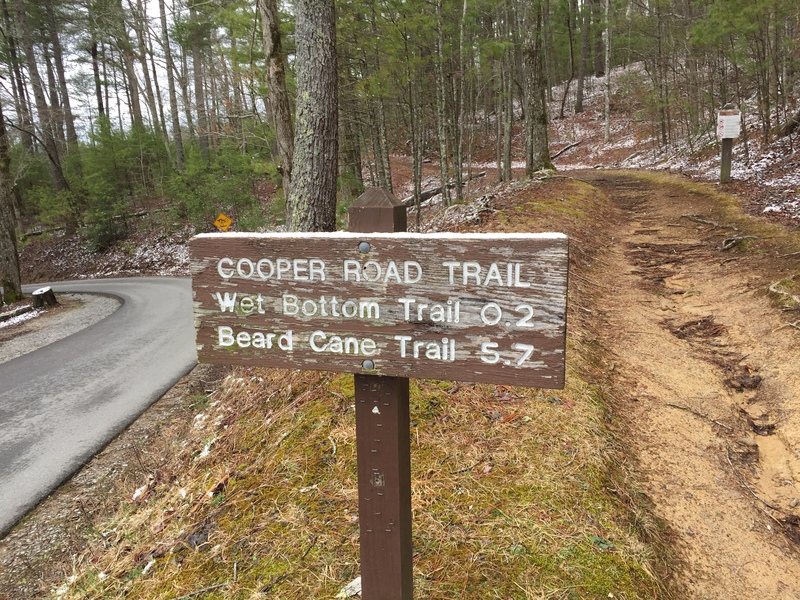 Cooper Road was a main thoroughfare servicing Cades Cove before the establishment of the Park and much of it enjoys wide double track and relatively well graded terrain as any former roadway or railroad bed. In fact, Rich Mountain Road and Parsons Branch Road were similar in their day and the Park Service chose to maintain them as access roads. There are a few access points. 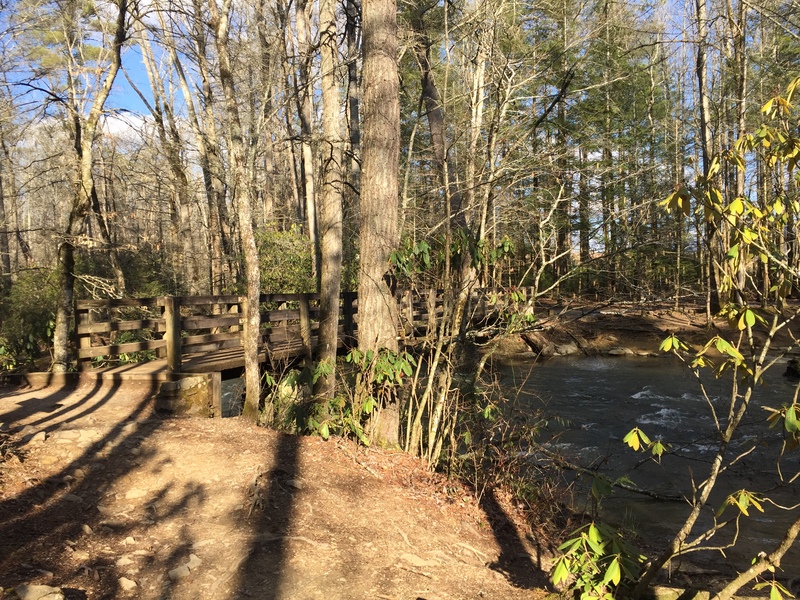 The trailheads are at Cades Cove Road on the east end and Abrams Creek Campground on the west end with ample parking at both. 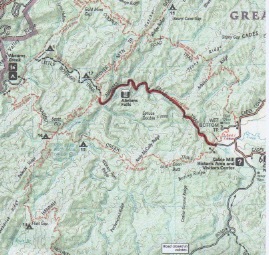 The third access point is via the Goldmine Road Trail about 2.6 miles from the Abrams Creek Trailhead. 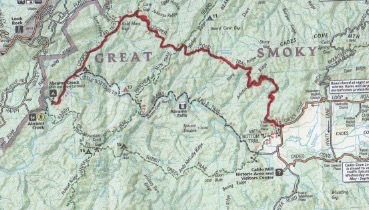 Surprisingly, there is only one campsite directly on the trail, which is CS #1 about 1 mile in from Abrams Creek at the trail junction with Little Bottoms Trail. CS #2 is reasonably close at 06. miles down Cane Creek Trail. The first section completed was part of a loop hike that included Abrams Falls. 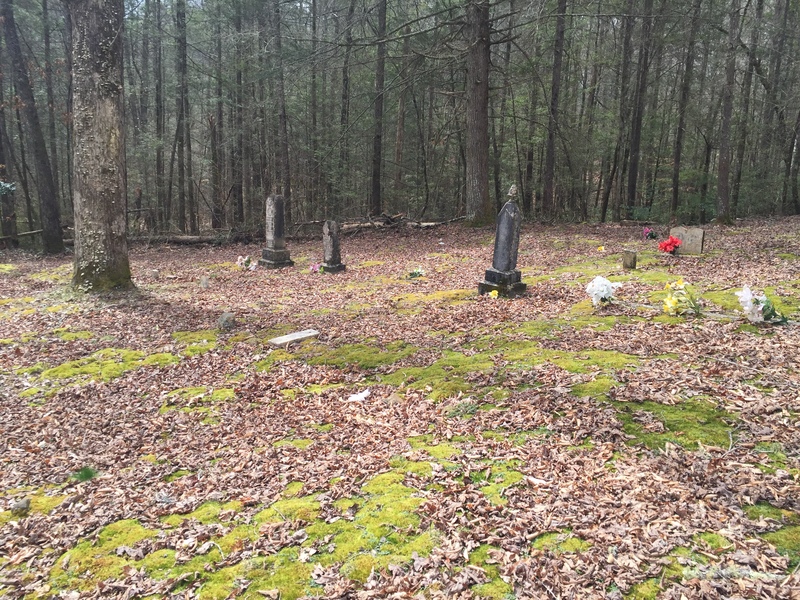 The section started at the Cades Cove trailhead. It was 39 degrees and overcast on the morning of Feb 26, 2016. 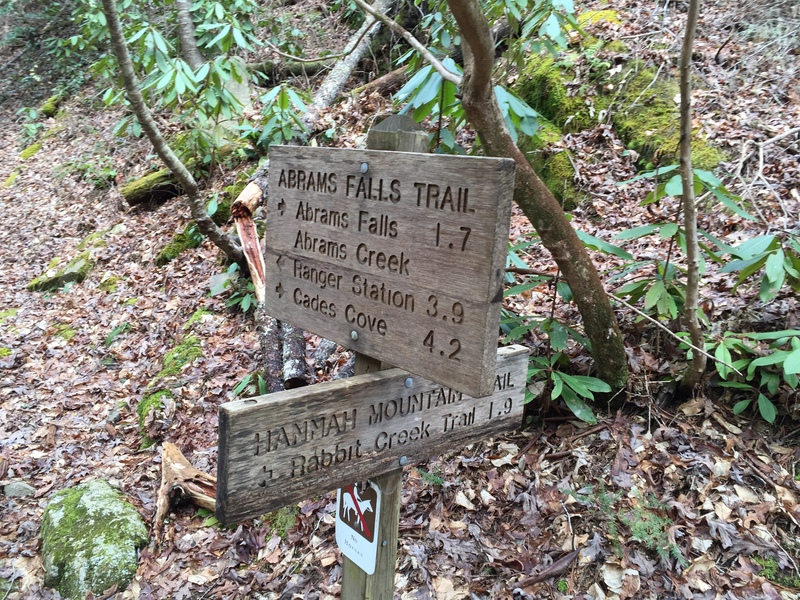 At 0.2 miles, the Wet Bottoms Trail intersects to complete a nice loop trail around Abrams Falls. At 1.0 mile, the trail rises gradually and levels off to a nice rolling stroll. A concrete bridge appears at 1.4 miles as the trail crosses Arbutus Branch. A moderate climb continues to about 1.7 miles where views appear although on this day, the clouds robbed the hiker of any panoramic landscape. The trail reaches a ridge at about 2.5 miles and continues fairly flat before a slight descent at 3.0 miles. At 4.0 miles, you cross Stoney Brook in a rock hopper. Two prongs of Wilsons Branch are encountered around 5.0 miles that are negotiated with some skillful rock hopping. 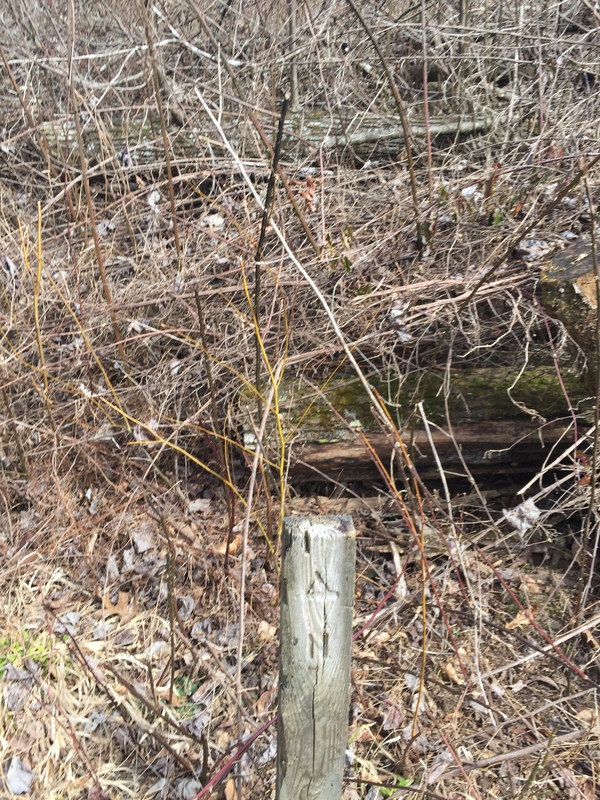 Following the two creek crossings, there is a bit of overgrown brush and briars that only last a few hundred yards or so. There is some blow-down evidence in this area accompanied by some pine tree growth. 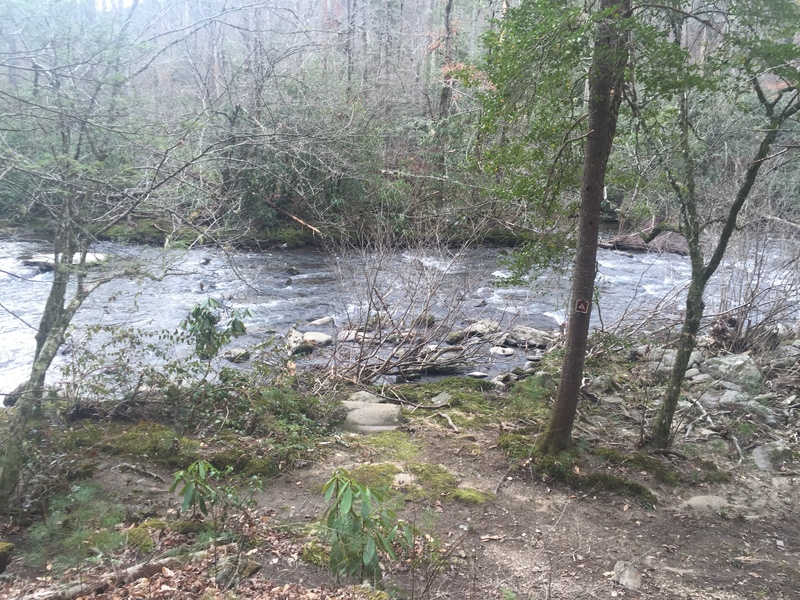 At 5.7 miles the trail intersects with Hatcher Mountain Trail and continues on to Cane Creek Trail which is 1.8 miles ahead. 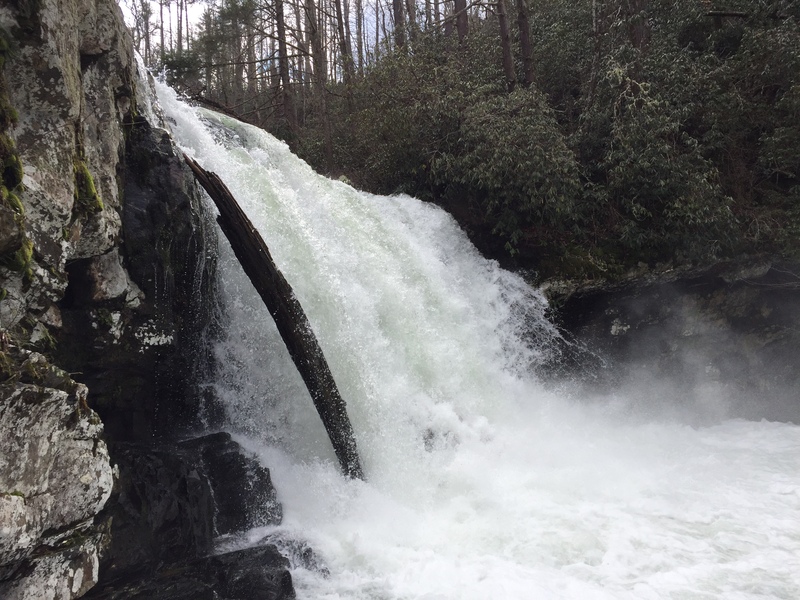 For this hike, I left Cooper Road down Hatcher Mountain to make the Abrams Falls Loop. Continuing on the trail description is going to be a bit tedious and out of sync as the next section was hiked starting at Abrams Creek Campground as part of a 2-day backpacking trip that occurred March 12-13, 2016. The trailhead is at Abrams Creek Campground where there is good parking, even in the off-season when the campground is closed. The trail begins at the back side of the campground and continues for the first mile or so along Abrams Creek. The trail only ascends 250 ft. over this 2.6 mile section making the climb barely noticeable. At 0.9 miles, the Little Bottoms Trail intersects from the right and Campsite #1 is just beyond. It is fairly nice site, especially being so close to a trailhead. By now the trail picks up and follows Kingfisher Creek for the next mile. 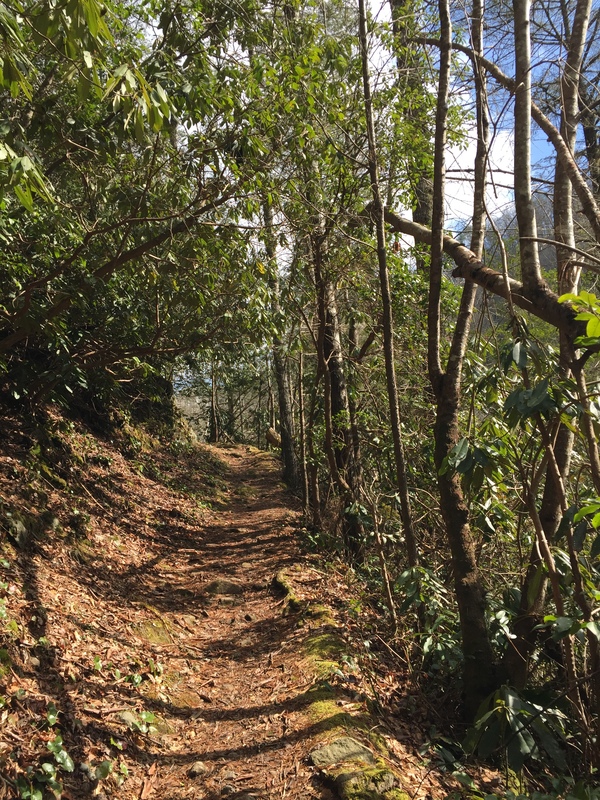 At 2.6 miles the trail intersects with the Goldmine Road Trail, which leads 0.8 miles to the Top Of The World Community on Chilhowee Mountain. 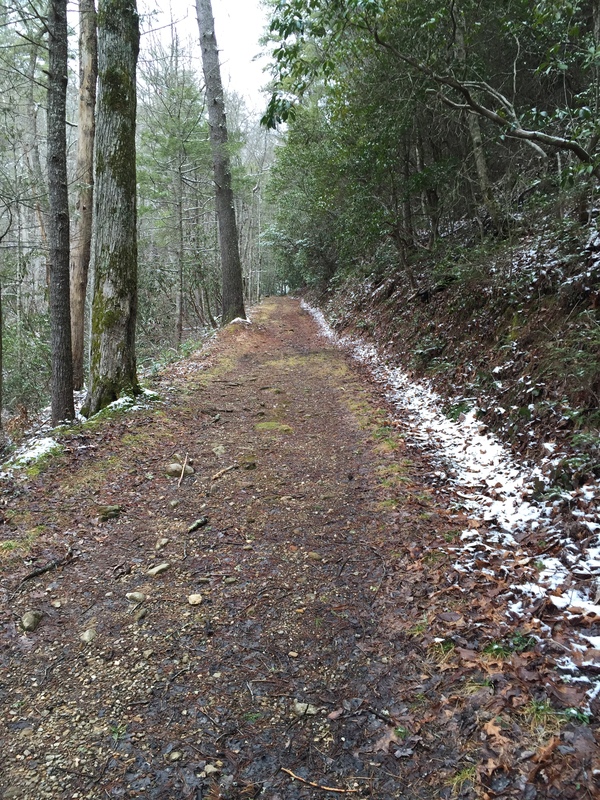 From Goldmine Road, the friendly stroll continues almost flat to Cane Creek Trail in 0.6 miles. 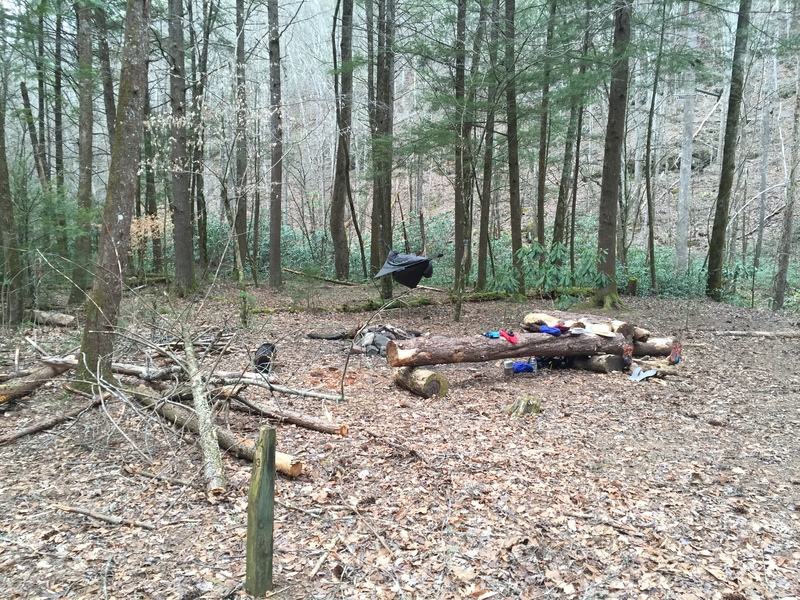 Campsite #2 is about 0.6 miles down Cane Creek Trail. 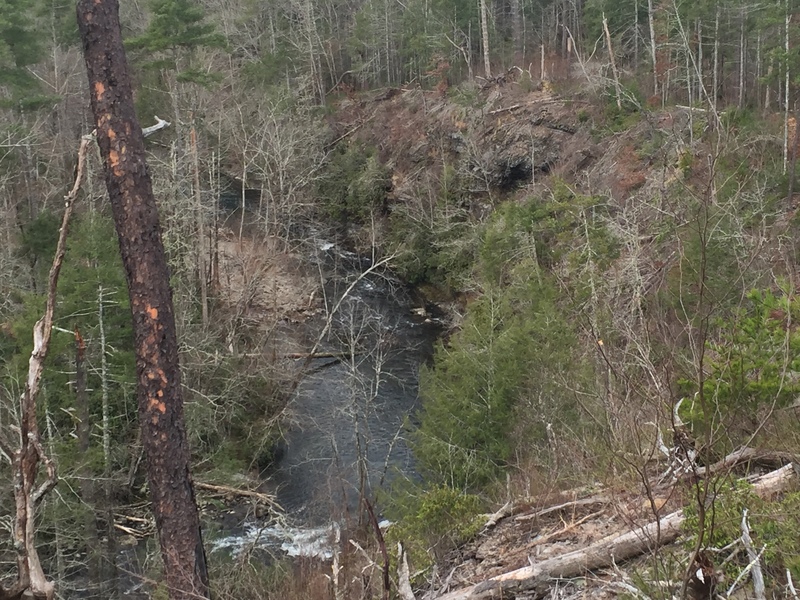 The first 1/4 mile from Cane Creek is the first indication that Cooper Road Trail climbs at all, climbing nearly 200 ft, which is 800 ft. per mile but it quickly levels out for more of the very gentle climb this trail has enjoyed from the trailhead. This 1.8 mile section was complete in 32 minutes which is a 3.3 mph pace… with a backpack. A testament to how level the trail is in this section. 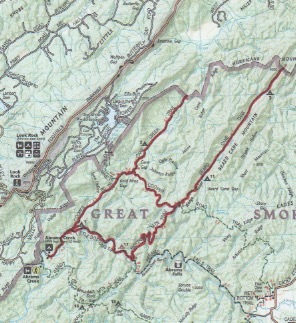 The section ends at the intersection with Hatcher Mountain Trail and Bread Cane Trail. From here it is 5.7 miles back up to Cades Cove. 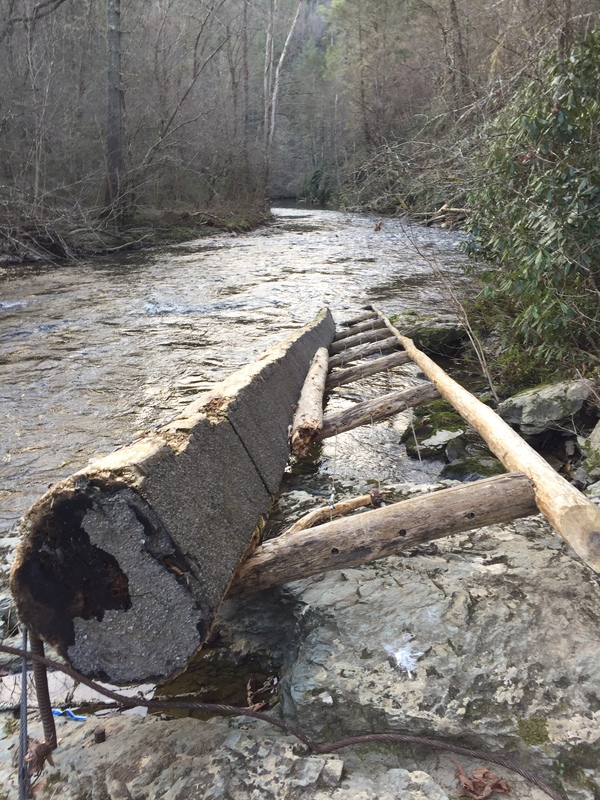 This entry was posted in Trail Log and tagged Abrams Creek, Cades Cove, Cooper Road Trail on April 6, 2016 by blogginggazelle. 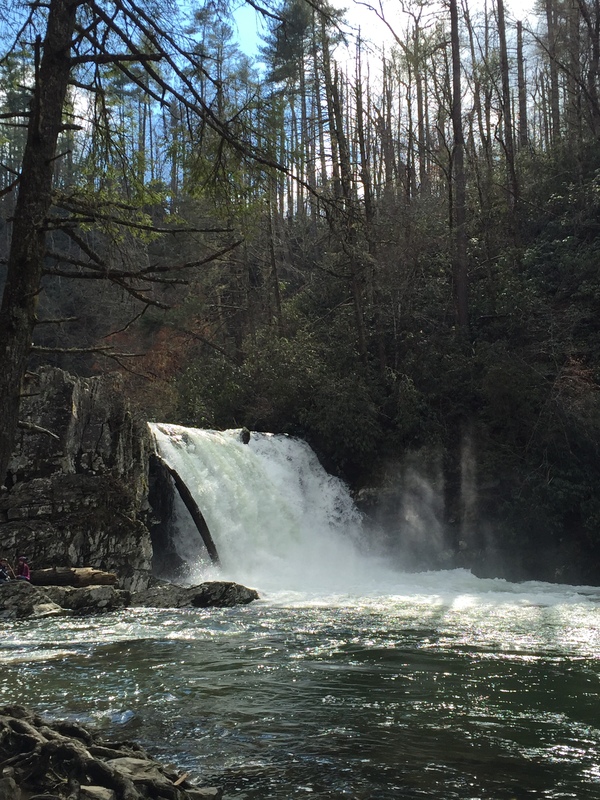 Abrams Falls Trail is a marquee trail of the Great Smoky Mountain National Park. 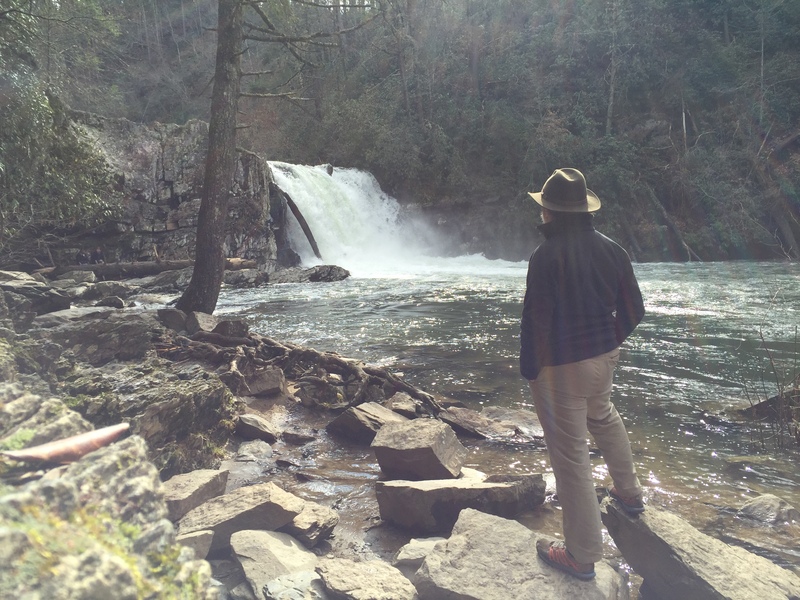 It is very approachable for most any hiker and it features Abrams Falls, which is one of the most spectacular sights in the Smokies. The trailhead is at a parking area off Cades Cove Loop Road. The Brown Guidebook states that Abrams Falls was named for Cherokee Chief Abram. 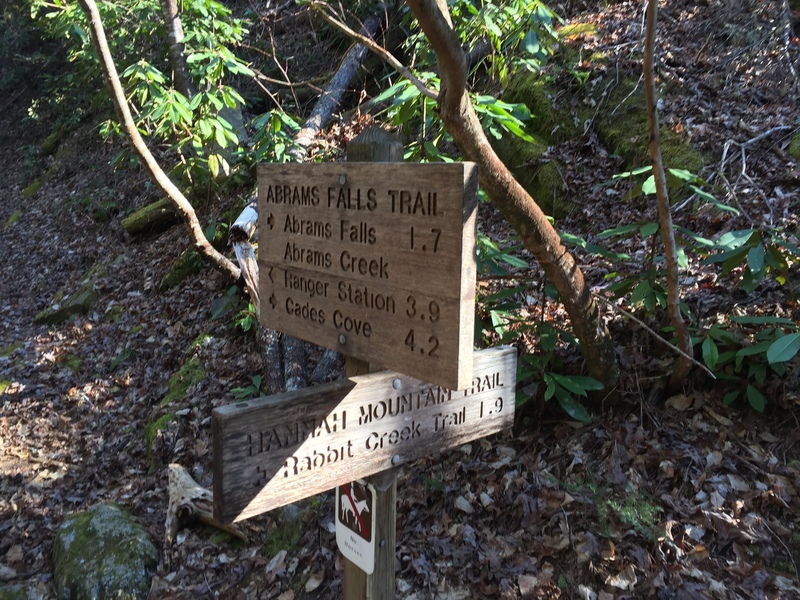 There are no campsites on Abrams Falls Trail and there are no substantial water crossings. Most hikers will take this trail from the trailhead at the parking area and return as an out-and-back. But there are a couple loop opportunities that add depth and variety to the hike that are well worth considering. This particular hike was documented in a loop hike that started at the Cooper Road trailhead just before the parking area for Abrams Falls. This loop went from Cooper Road Trail to Hatcher Mountain Trail to the far end of Abrams Falls Trail which is how this hike is documented. Another great loop is to take Abrams Falls to Hannah Mountain (fording Abrams Creek) to Rabbit Creek and back up to the Abrams Falls trailhead. Note that the ford at Abrams Creek is normally passable in knee deep current but in times of high flow and swift current, the ford is too dangerous to consider. The end of Abrams Falls is at the junction with Hatcher Mountain Trail and Hannah Mountain Trail at a beautiful place on Abrams Creek where you must ford the Creek to continue on Hannah Mountain Trail. The trail starts out pretty level and continues for a half mile until it begins a gentle rise in elevation. The trail follows Abrams Creek all the way to the falls proving company and a symphony of river music. 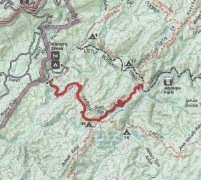 At about 0.8 miles there is a small creek crossing. As you reach 1.3 miles, the trail moves away from the Creek causing the sound of the river music to change keys as though a different movement of the symphony began. By this time the trail rises significantly above the Creek with a great view of the cascades down below. 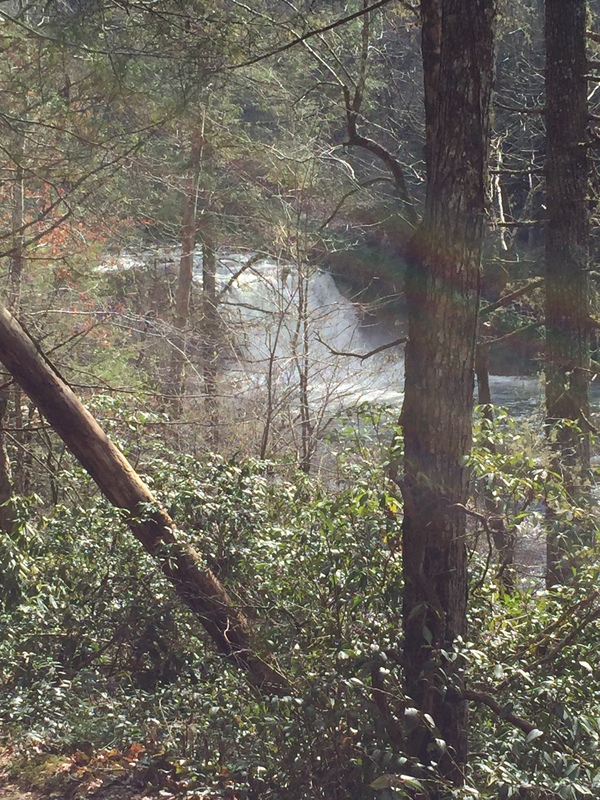 At 1.5 miles, the falls come into view through the wintertime foliage. At 1.7 miles, you cross the foot bridge, which is a door of sorts to the inner sanctuary that is Abrams Falls. This particular day, the Falls is flowing more than normal due to heavy rains in the past few days. There are few visitors here giving a little solitude to the experience. On a summer weekend, you will encounter dozens of visitors, many of which will risk a dip in the pool that receives the Falls. I captured more of my personal experience in my entry for the loop hike. After a good break, I continued up the trail toward the trail head. The elevation continues to rise gently and the trail widens. 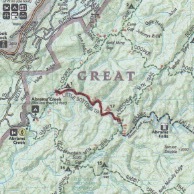 At 3.3 miles the trail starts to distance itself from the creek by veering away from the gorge. At 4.1 miles you reach the bridge that leads across Mill Creek to the Trailhead just beyond. 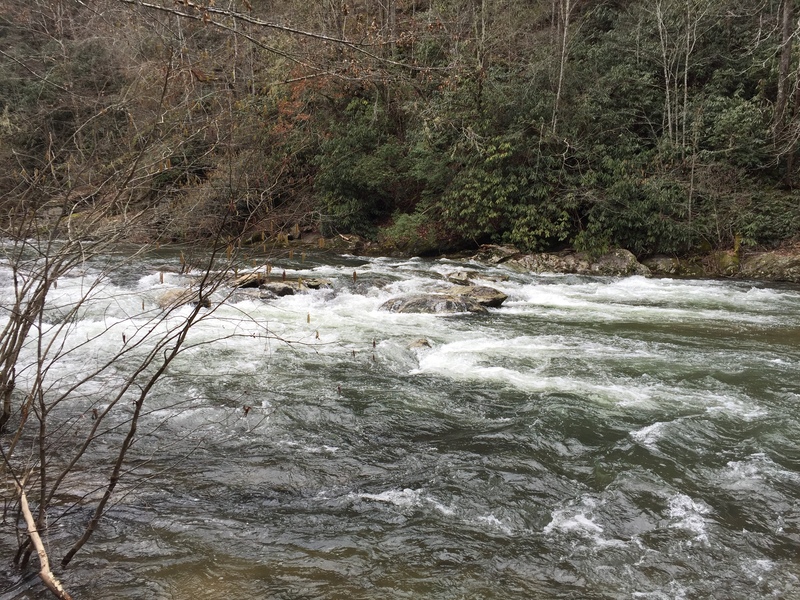 This entry was posted in Trail Log and tagged Abrams Creek, Abrams Falls, Abrams Falls Trail on March 19, 2016 by blogginggazelle. 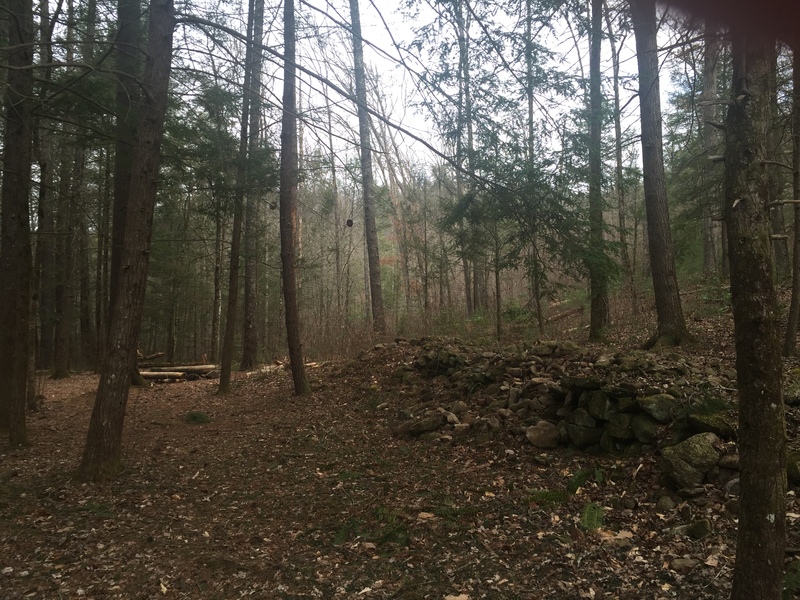 By now, I have documented a few hikes made up of sections of different trails, which presents a bit of a problem with keeping a detailed record of each trail. A 900 miler accumulates a number of trail segments from different trails at any given time. It’s pretty easy to keep up with on a spreadsheet. 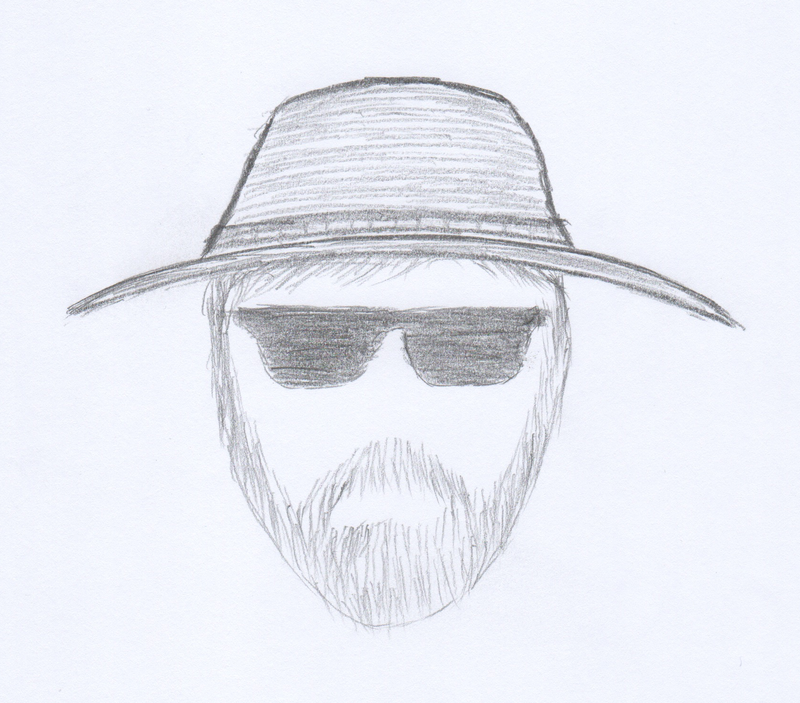 With a blog though, it presents a dilemma of sorts. Should you write up the hike with incomplete trail sections or wait until all sections are complete before documenting the hike. With this post I will attempt a shift in strategy. Whenever I hike hike a number of different segments, I will present the experience as the total hike and reserve specific details when each segment is completed. And so this hike started out to be a loop around Abrams Falls. 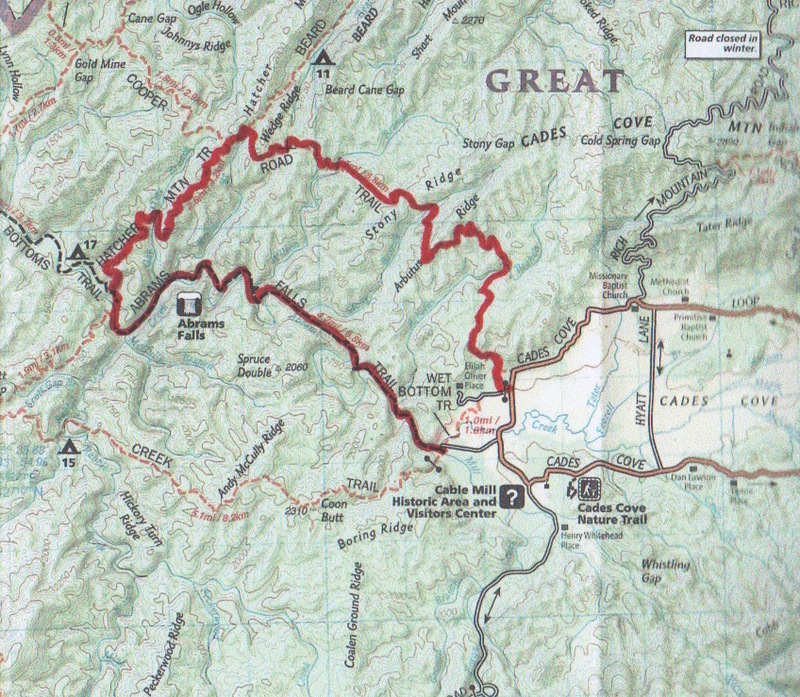 The original path was to be Cooper Road to Hatcher Mountain to Hannah Mountain to Rabbit Creek and out. At 10:39 on Friday, Feb. 26, I parked the 4Runner at the Cooper Road trailhead. It was a brisk 39 degrees and overcast. Traffic in Cades Cove was non-existent which made getting to the trailhead a pleasure. The trail climbs gently for about 3 miles and crests as it heads down to Hatcher Mountain. 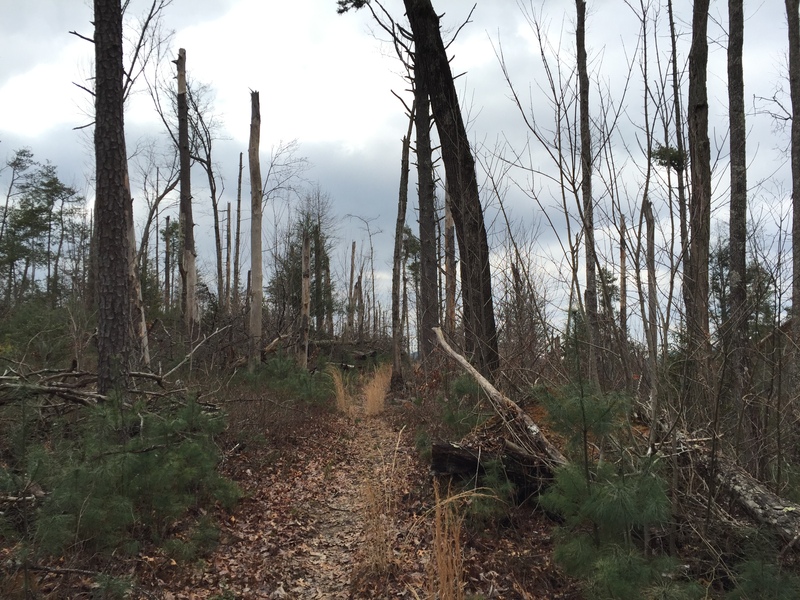 Toward the end of the section, there is significant blowdown activity with brushy new growth and small pine trees returning. At about 5.3 miles, I came across a couple older 900 milers on their 3rd map. We exchanged information about trail conditions and one mentioned this would probably be their last map. I rebutted his statement saying that you always start the next map but they seemed to agree together that too many birthdays had passed and 3 would be plenty. After 2 hours and 20 minutes I made it to the Hatcher Mountain Trail. 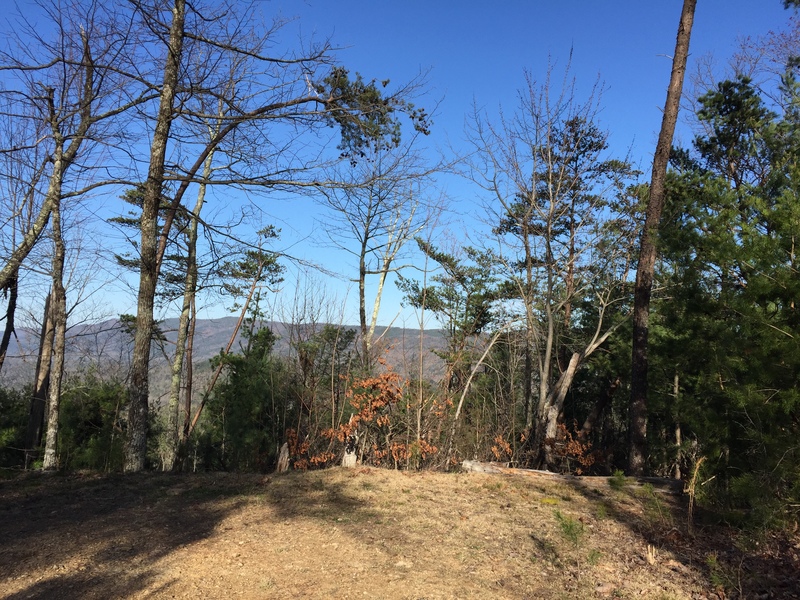 Hatcher Mountain breaks out with views across to Chilhowee Mountain and Look Rock. The hike is steady and slightly downhill the whole way and very pleasant. Once again, there are sections that suffered from significant wind damage with twisted blowdowns but the trail is clear and the openness makes way for some great views. There was still snow on the peaks of the ridge. At about 2 miles, you begin to hear Abrams Creek down in the gorge as it becomes visible through the open ridge. The river music follows you all the way to the end of Hatcher Mountain Trail at the junction with Abrams Creek Trail. The plan was to pick up Hannah Mountain Trail and continue on to Rabbit Creek Trail but upon arrival, you are met with an obstacle. That being the fording of Abrams Creek. Normally, the creek is no more than knee deep. Conditions this day were as follows: Temperature, low 40’s. Water level: extremely high due to recent heavy rainfall. Current VERY swift. Total number in the group of hikers: one. The thought of a waste deep ford through swift current induced me to reconsider my hiking plan. To my great fortune, the Abrams Falls Trail also terminated at this Junction so discretion took the better part of valor and I headed back up toward Cades Cove on the Abrams Falls Trail. For some time now, Abrams Creek accompanies you, providing a full choir of glorious river music all the way to the falls. The trail gains about 600 feet over its 4 miles so the ascent is slight and gradual, making for a glorious walk all the way. As the trail turns away from the creek and then returns back toward it, the magnificent sound seems change key like different movements of a symphony. The rapids of Abrams Creek are always visible through the wintertime foliage. At about 1.5 miles, through the trees, you finally see it. The majestic Abrams Falls comes into view in all its glory and the reason for taking this unplanned route reveals itself in a wonderful surprise. The flow of water over the falls is as full as I have ever seen it, spanning the full width of the falls without a single break in the swooping wall of water. Excitement builds as you follow the sight for the next 300 yards. Finally you come to the footbridge that leads you through a door to the sacred place that is Abrams Falls. As I entered the sanctuary, I was thrilled to see only a half dozen other pilgrims had made the trip. Over the 45 minutes I spent at the falls, I was blessed with 20 minutes of solitude as the other visitors left for the trailhead. The time was magic as all Creation performed its concert giving witness to the Creator in full glory. When we are gifted with a glimpse of Heaven, we can only stay for a while before we must return to the domain of Man. Such as it was with this visit and about 3:20 PM, I headed for the trailhead at Cades Cove. The sun arrived during my moment in the sanctuary and it turned the day into perfection for the walk up. Blessings tend to come when they are completely unexpected and today was exemplary of this fact. Had I been able to stay with my original plan, I would have missed the falls in its full display of raw power and sound. And yet, I would never have known. This all makes one even the more thankful because the gift was precious and its giving was not anticipated. This is the way of grace. 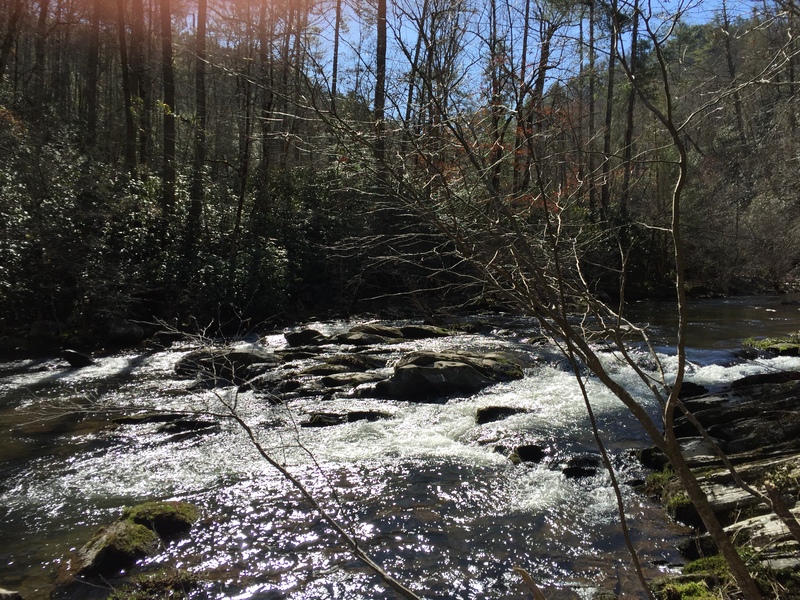 This entry was posted in Trail Log and tagged Abrams Creek, Abrams Falls, Cades Cove, Cooper Road Trail, Hatcher Mountain on March 19, 2016 by blogginggazelle.